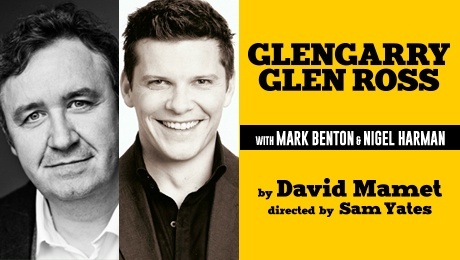 Joining the hard-hitting sales team in Sam Yates' unmissable production of David Mamet's darkly funny classic, Glengarry Glen Ross are: Denis Conway (The Lieutenant of Inishmore) as Dave Moss; Wil Johnson (Rosencrantz & Guildenstern Are Dead) as George Aaronow; Scott Sparrow (King Lear) as John Williamson; James Staddon (Goodnight Mister Tom) as James Lingk; and Zephryn Taitte (The Jungle Book) as Baylen. They join the previously announced Mark Benton (Shelly 'The Machine' Levene) and Nigel Harman (Ricky Roma). The production will open on Thursday 14 February 2019 at the New Victoria Theatre, Woking, and will then visit Birmingham, Plymouth, Cheltenham, Cambridge, Bath, Manchester, Milton Keynes, Glasgow, Richmond, Brighton, and Cardiff. The national press night will be held on Wednesday 20 February at The Alexandra Theatre, Birmingham. The production of this trailblazing modern classic has designs by Chiara Stephenson, lighting by Richard Howell, and is produced by ATG Productions, Act Productions and Glass Half Full Productions.